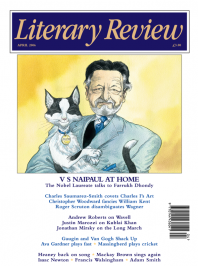 V S Naipaul hasn’t been well. Feeling more comfortable with Indian doctors and medical provision than with the National Health Service, he has been in New Delhi for several months for treatment and recovery. Now he’s back in England and says he’s writing again. I visit him in his Wiltshire cottage and the following interview is conducted in short periods over two days. He’d like me, he says, to follow his own method of interviewing, which is to take notes in longhand as the subject speaks: he doesn’t trust tape-recorders. I don’t trust them either, and so have brought two with me, pocket-size, and made sure they have fresh batteries. I place them in the least obtrusive position on the dining table, at which we sit.